Black bottomed cupcakes seem to have been much talked about recently, but as I wasn’t exactly sure what they were I managed to remain unruffled. However, having seen this Hummingbird Bakery recipe recently in an old magazine, I had to make it for sure. Chocolate cake marbled (sort of) with cream cheese and lumps of milk chocolate – what an inspired mix! I hunted down the recipe, finding it at Delicious Magazine, then set to. Whisked together 190g flour (a mixture of wholemeal & white spelt & buckwheat), 120g vanilla infused granulated sugar, 40g cocoa, 1/2 tsp baking powder and a pinch of salt. Made a well in the centre and poured in 40ml sunflower oil, 1.5 tsp of cider vinegar and 200g water (was meant to be 125g, but this was way too dry). Mixed this thoroughly and spooned mixture into 12 cupcake cases. In another bowl, mixed 140g cream cheese (I used ricotta), with 40g caster sugar (recipe stated 60g), an egg and 1/2 tsp vanilla extract. Cut 100g bar of green & black’s milk chocolate into 1/2 squares and mixed into cheese. Spooned this on top of the chocolate mixture. Baked in a preheated oven at 170C (gas 3) for 20 mins until well risen and cheese mixture was slightly golden. I tried really hard to follow the recipe, but as regular readers will know, I find this difficult and usually end up changing something. This time, the only adjustment I intended to make was to reduce the amount of sugar in the cheese filling and to use vanilla sugar instead of extract in the chocolate cake. However, things did not go according to plan. The quantities were a little odd and didn’t really work. The chocolate cake mixture ended up being a rather stiff paste rather than the dropping consistency I was expecting. I just added a lot more water and it seemed to work fine. This was the first time I’ve used the whisking method with dry ingredients and I don’t think I will be repeating it. It took me ages to get all the lumps out – sieving is much faster. Although I made the recommended cheese topping, I felt it would spoil the effect and it didn’t really need it anyway. So I’ve put that in the fridge to be used another time. I was certainly very pleased with the results. I loved the look of these cupcakes, quite spectacular I thought – all black and white with bits of chocolate erupting out of them. They tasted really good too – a very light sponge, not overly sweet, with soft cheesecake lava surrounding the more resilient sweet chocolate pieces. CT thinks this is a geology lesson in a cupcake and suggests they should be renamed as Magma Cakes. The sponge is vegan friendly – the rest, you may have noticed, isn’t! A real winner this one – a future tea party special I think. I shall most certainly be making these again. These look lovely Choclette – did you get black bottoms to the cupcakes, or did the marbling go through the whole cake after baking? Hi Suelle – the cakes were most definitely black bottomed. When I first turned them out, they looked great upside down. These look fab Choclette – I have had my eye on these for ages – this just confirms I MUST make them. Ooh they look absolutely delicious, they are definitely a contender for a tea party – can I come? I have never heard of black bottomed cakes – in my case it would mean that I had left them in the oven for a bit too long! Wow, these look fabulous! I’ve tried to make them before, and was fascinated that the cream cheese part didn’t have any flour in it – it really is like a bit of cheesecake – yet they set quite cakelike. Lucie – do try them out. I’d be interested to see how yours look and what you think of them. Kath – yes the name isn’t perhaps the most enticing. Would love you to pop along for tea of course, but perhaps rather a long way for a couple of cupcakes. Celia – Will have to pop over to your blog to see if you’ve posted about them. I was really impressed with how they turned out. Reminds me of the Marble Cake my mum used to make when I was a child, always fascinated me! Mind you it did not have big lumps of chocolate in it, so these must be extra yummy. I tried a black bottom cupcake a while back, it was so yummy! I loved the different textures in the cake and cheesecake elements. I’ve been dying to make them so thanks for sharing the recipe! I adore black bottom cupcakes and these look awsome! I am wondering if the “off” quantities in this recipe is a general Hummingbird issue – I have heard the exact same thing over and over again about the recipes in their cookbook. Maybe the recipes haven’t been properly tested for such small batches? I just found your yummy blog via Chow and Chatter-love it! I will be back soon to go back and read all of your recipes. These look perfect for my tea time. I’ll surely eat more than one. Looks delicious….mmmm. Janice – now theirs and idea – marble cake with big lumps of chocolate! Jenny – whose did you try? Hilary – yes I did see some mutterings on the blogosphere about the book. So no idea what the Hummingbird’s version of this is like, but I was not at all disappointed with mine. It could be as you say, that the recipes have not been properly tested. Natasha – welcome and thanks for you kind comments. Hope to hear from you again. Thanks Katie – you are right about these flours absorbing more water, but I have read that others have had problems with the mix being too dry as well. Happy New Year Choclette! I’m devotedly lurking your blog, enjoying all the mouth-watering creations! 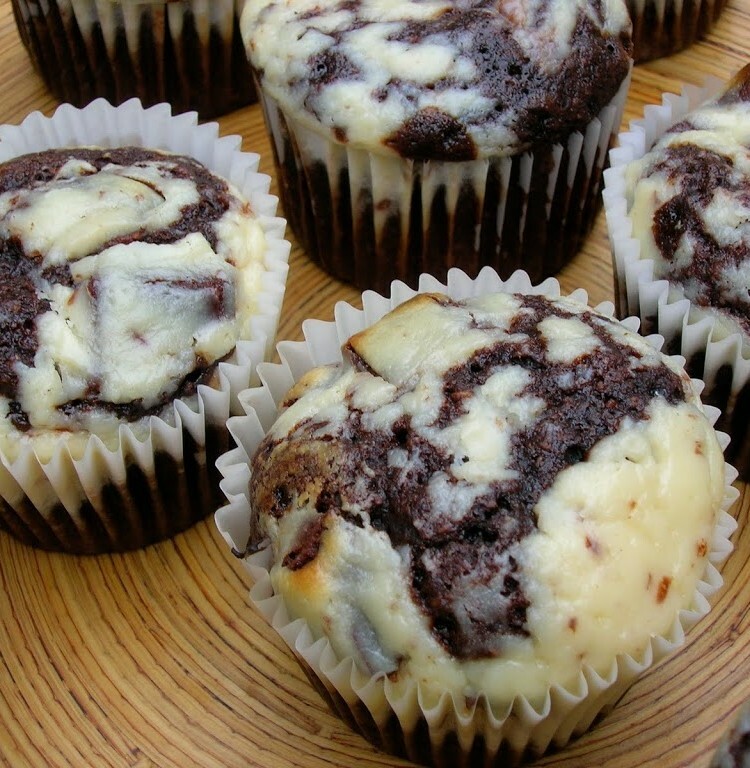 Marbled cupcakes, superb. My kids would love them. Must have a go at these – I bed mine don’t turn out as nice though! The marbled effect is really good!